Thank Jeane for her card. 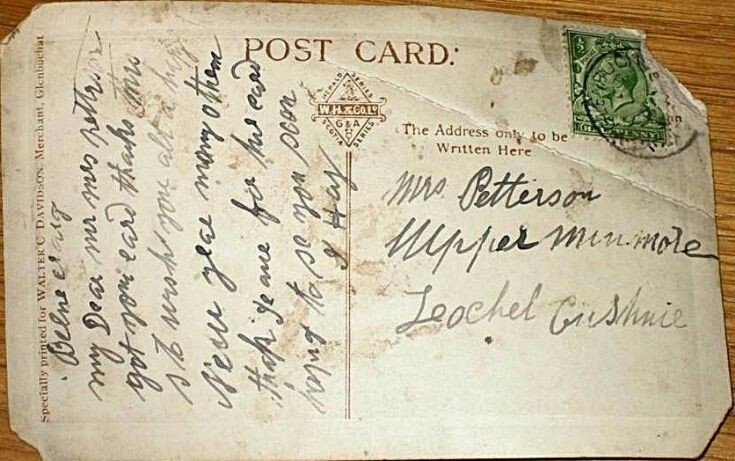 This Post card is interesting for a number of reasons. Firstly the stamp with the head of George V dates the card about 1934. The letter is from ? G. Hay. The Hay family lived at Craighead, a croft at the top of the Belnacraig brae. George Hay lived there until the early ninteen eighties and he would have been about 80 when he left. You can see his handwriting in a poem ‘The Garnet Rock.’ Is this from him or an older relative. Finally who is Mrs Petterson at Leochel Cushnie and are they connected? Perhaps someone may let me know.